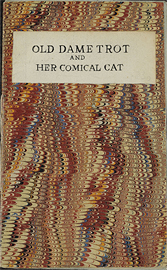 Old Dame Trot and her comical cat. Part I. First sentence: "Dame Trot and her Cat Sat down for a chat; The Dame sat on this side, And Puss sat on that." Copy in McGill Library's Rare Books and Special Collections: hand-coloured frontispiece & title-page vignette; 6 half-page, hand coloured illustrations. Marbled wrappers, added later, as are the stiff blue paper mounts for the pages. Osborne - p.94. Adelphi Book Shop. Victoria, B.C. Oct./70. $10.00. text.chapbook.black and white, 17 x 11 cm.